Rent Grand Eastonian Suites Hotel | Corporate Events | Wedding Locations, Event Spaces and Party Venues. Come experience the historic charm and warm hospitality of the Grand Eastonian Hotel & Suites. We're the perfect location for your visit to Easton, Bethlehem and western New Jersey. Spend the night in one of our newly designed classic guest rooms, a spacious suite or in one of our extended stay suites, all graced with a "loft" style, rustic beamed concrete ceiling. 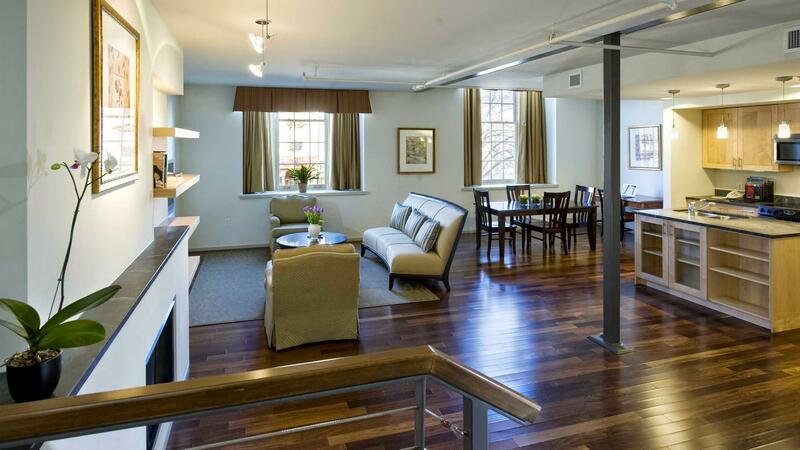 Our suites are beautiful and offer chestnut wood floors, fireplace, flat screen TV and marble baths. Relax in our onsite fitness center, swim in our indoor pool and enjoy WIFI, all complimentary for our overnight guests. Or stroll along the adjacent river walks or enjoy historic downtown Easton and its many award winning restaurants and shops, just footsteps away. Explore local attractions such as the Crayola Experience, Martin Guitar, Blue Mountain Ski Resort along with Lehigh University and Lafayette College. For nearly 85 years throughout its history the “Hotel Easton” has been the premier site in Lehigh Valley for weddings, corporate meetings, social events and family gatherings. Now, come experience the restored elegance and tasteful atmosphere of the Grand Eastonian Hotel & Suites. Our gracious services and finely appointed Gold Room will impress your group and stir up grand memories from years past. The Grand Eastonian Hotel & Suites in the Lehigh Valley is the perfect venue for your event, whether you are planning a special corporate meeting, social function, family gathering or an elegant wedding. And if your group is for over 100 guests, we can expand to our Terrace and accommodate nearly 175 in comfort and style. Step out of the ordinary and celebrate your wedding in the gracious and classic ambiance of the Grand Eastonian Hotel & Suites. Our 1926 historic hotel is the ideal venue for refined, romantic and fun destination weddings; offering picturesque settings, stunning culinary selections and attention to every detail. So relax, celebrate and enjoy. Come dance, dine and live the wedding of your dreams. You will love our intimate atmosphere and the sophisticated offerings at the Grand Eastonian Hotel & Suites. For almost 100 years we've hosted gracious gatherings, so whether your celebration is intimate or robust, our team of professionals will insure a stunning day, tempting cuisine and first class hospitality.